Lauren is twenty seven weeks, five days. 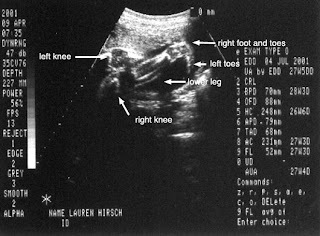 Ultrasound shows the baby right on schedule. The baby weighs approximately 2 pounds, 7 oz so far, and is looking great. 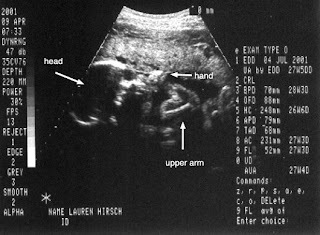 Here is a picture of the baby's legs and head, right hand and arm. Oh, and the doctor is now quite certain we've got a girl.